Samsung has released all the details on the launch of its Galaxy Tablet in the US which will be in consumers’ hands within the next few weeks. Chances are it’ll be available just before the start of the holiday season this year. What’s more interesting and encouraging for eager consumers is the fact that the Galaxy Tab is coming to all four major wireless carriers in the US, namely, Verizon, AT&T, Sprint and T-Mobile. This is a smart move to tap in to the whole market of users as the device is sure to sell more because of its availability on all networks. It’ll make people more comfortable and receptive as they can stay on their chosen network instead of having to jump ships to get their hands on the Galaxy Tab. Samsung didn’t announce any pricing details today but they will obviously depend on carriers, both in terms of retail price and data plan pricing. 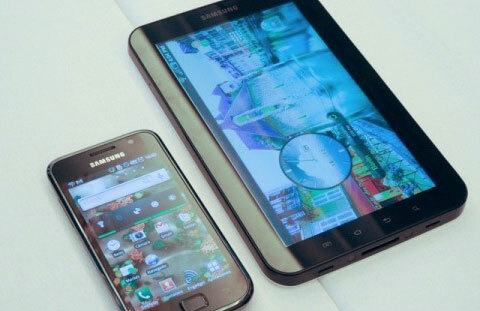 The seven-inch Galaxy Tab will run Android 2.2 (a.k.a Froyo) with a Cortex A8 1 GHz processor and 16GB of onboard memory. It weighs half as much as an iPad and its battery will last through seven hours of continuous video playback. It will also come with a car dock for large-screen GPS navigation and more. The Tab will have a 3-megapixel, rear-facing camera with a flash, HD-quality video captures and a 1.3-megapixel camera on the front for video chat. Unlike the iPad, all sorts of Flash content like videos and interactive games will run perfectly on the Galaxy tab as Android has no problems with Adobe. Samsung has scored licensing and deals from major entertainment companies like MTV, NBC, Warner and lots more to bring legal entertainment content to Galaxy Tab users. Its Media Hub will allow for on-demand movie and TV rental and purchase for instant playback. Purchased content will be available on multiple registered devices; in other words, you can download the same content on any device you own that works with Media Hub. This is expected to include all Galaxy S devices. The Social Hub feature on the Galaxy Tab will provide support for all major social media and there is also a Daily Briefing for news, calendar, stock quotes and much more. Along with all the good news, there’s some disappointing news too for American users as it was revealed that the Sprint Galaxy Tab will be a 3G-only device and telephony facility has been completely cut out of the Tab for the US market on all carriers. This will be a major setback for the Galaxy Tab and Samsung as now the device won’t serve as a dual tablet/smartphone package like it does in the European market and else where. This should also affect the prices and it remains to be seen whether consumers will be comfortable with the 2-year contract that carriers are offering as a compulsory condition.